Many people ask me where in the world do I find the fruit for making jelly. Finding these plums is a good example of how I find fruit. Today I was sitting at my local gourmet restaurant , Whataburger, when I noticed fruit on the trees outside the restaurant. Upon finishing the meal I strolled outside to inspect the trees. There were 5 plum trees full of ripe fruit. Four of the trees had red fruit and one had yellow fruit. Not only were the trees full but so was the ground. In fact, one could not walk by without stepping on the plums. My brother-in-law and I picked up all the fruit I needed from the ground. These are most likely a Mexican plum. They are 3/4 of an inch in diameter so they hardly compare with the standard plums. They made for a wonderfully tart and colorful jelly. We picked about 10 cups of fruit. During the time we picked the fruit not one person inquired what we were doing. Mexican Plum (Prunus mexicana) is a small (20 feet) understory tree in creek beds and along fence rows. It ripens in late August-September in the eastern half of the state. It is often planted around homes in Central Texas. It bears fruit without any additional water even in a drought. Because the plums are so small you do not cut them up into pieces. Instead put them into a pot and add enough water to cover them. Boil them for 20 minutes. Once they are thoroughly cooked mash the fruit with a potato masher. Continue to cook another 10 minutes. Run the plums through a food mill sitting over a sieve to extract all the juice. Should you want to make jam simply use the pulp that is now in your sieve since all the seeds should remain in your food mill. For jelly pour the juice into cheese cloth. Then take this juice (and pulp if making jam) and put in your kettle. Bring juice to a boil and then add 1 pkg of No sugar needed pectin. When the jelly has once again come to hard boil slowly add sugar. Bring to hard boil for 1 minute. Cool, then pour into freezer containers. and place in the freezer until needed. As you can see from the picture the jelly has a beautiful color. It has a pleasantly tart flavor. 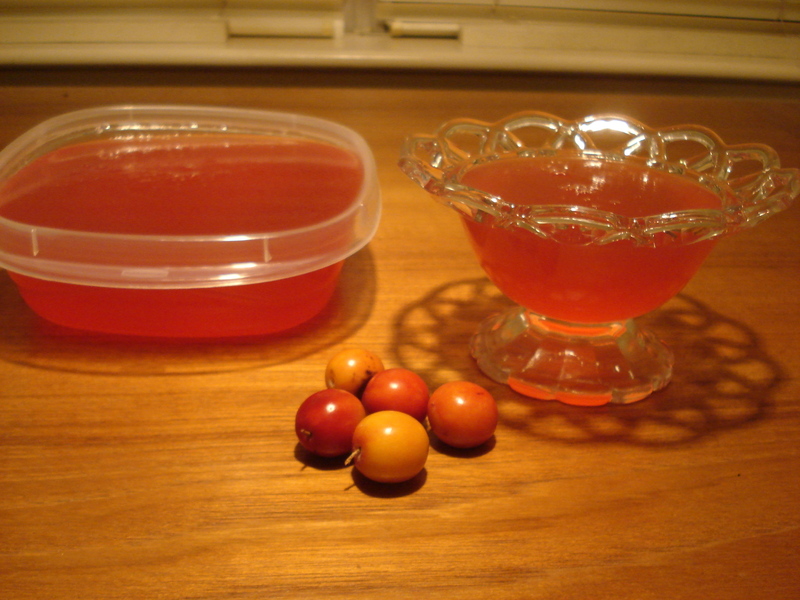 Gallery | This entry was posted in Recipes and tagged freezer jam, freezer jelly, Mexican Plum, Mexican Plum jelly, Ornamental Plum Jelly, Plum jelly, Pretty jellies, tart jellies, unusual jellies, Using ornamental fruit, Wherre to find fruit, wild plum, Wild Plum Jelly. Bookmark the permalink. Thanks so much for the recipe! I have 7 wild mexican plum trees in the yard of the house I’m renting and look forward to making some! Am glad to help. Could you let us know when they are ripe? My mexican plums are ripe right now. Great to know Debbie. And if they aren’t all ripe you can pick the green ones and let them ripen until soft to the touch. Thank you. Thanks for this recipe. I just finished getting the juice ready–it’s such a beautiful color. My husband found a plum tree loaded with fruit when we were out looking for Canadian Thistle. We found very little thistle so it was a double good trip. Thanks for visiting the site. I am glad you enjoyed the recipe. It does have a beautiful color. Part of my enjoyment with each different batch of jelly is the different color when I see it in the jar or container. What state are you in that your plums are ripe? I may have this tree as I found some fruit even my dad who is 81 years old is not familiar with. It is about the size of a muscadine, reddish yellow here on Sept. 8th, 2013. The inside is not ripe yet, it is dark yellow inside also. It is near the creek bank, but I can’t decide which tree it fell off from just yet. I am interested in getting enough for jam. I don’t have enough info to help you. What state and county are you in? Could be a plum but it seems late in the season for that, at least in my area. My suggestion is to look around for more and determine what tree it came from. Where there is one there usually is more. Also take a picture of the fruit so you can send me a photo.Let me know when you have a photo and I will let you know how to send me the photo for id. Thanks for your response. From what I have read this Mexican Plum ripens in Sept. I live in Texas, Cherokee County. There are 10 wild plums native to Texas. Once you find the tree determine if it is growing as a solitary tree or is growing in a thicket of the same trees. Also note if it is 20 ft or taller or is only a small shrub. There are several plums in your area that ripen in September. What makes you think that the fruit is not ripe? Interestingly enough I found two Mexican Plum trees full of ripe fruit today. The fruit on the ground were overripe, in my opinion while the ones on the tree were just perfect. It pained me not pick the fruit but I still have a freezer full of fruit ready to be made into jellies. Of course your tree may be a week or two behind these two trees. 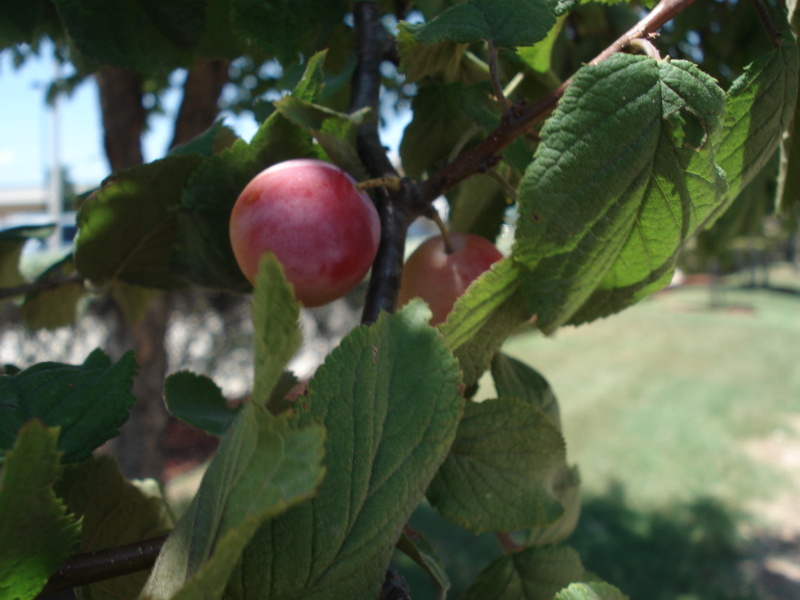 Where can I find a wild plum tree in the Johnson County Tarrant County area? Lydia- I find that the best time to find fruit trees is in the spring when they are blooming. The white flowers of the plum stand out from the leafless trees. Having said that, the next best way is to bike or drive around out in the country. You may not find the tree you are looking for but may find many other interesting things. There is a website where people locate wild fruit and nuts. http://fallingfruit.org/ I looked in your area for wild plums and didn’t see any but you may have better luck than I did. If you are willing to drive a bit I found one wild plum tree listed on the afore mentioned map for the town of Plano. Also, ask at your county extension service. There may be people there who can help you. Hope this helps.